Courtney Pulitzer's Cyber Scene: Fete of crepes, and Jesus! Fete of crepes, and Jesus! For a laïc country, France certainly celebrates, honors, and respects religious holidays an awful lot. For example, the schools have two weeks off for Toussaint (All Saints Day), in addition to Noël (Christmas) and Pacques (Easter). This year for my son's bake sale before the vacances Noël (Christmas vacation) my husband agreed to bake his famous cupcakes. The ladies at the cake stand were hawking the cakes with "gateaux Noël! (Christmas cakes). I found it even more amusing because the main hawker is Jewish and that she didn't say just gateaux (cakes). (Of course, I am familiar that lots of Jewish families have Christmas trees, but considering this was in a public school, I though they would be more religion-neutral. For the same cake sale, the PTA ladies inquired if anyone had a holiday music CD and I was the only one who seemed to have one. I brought it to the school and they were playing this CD full of Christmas songs. The directrice (principal) came out of her office, however, to advance the CD forward when "Gloria in excelsis Deo" started playing. She said we couldn't play anything "religious." And then this week, on Monday February 2nd, the schools (and France) celebrated La Chandeleur: a Christian festival commemorating Jesus' presentation in the Temple. 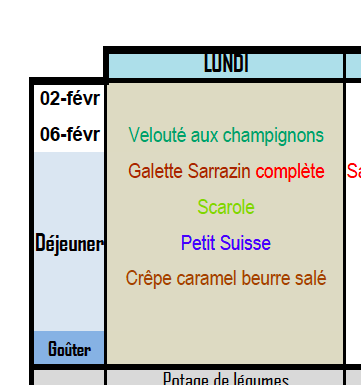 The school menu didn't state "Chandeleur" but the menu was crepes for the main course, and a dessert caramel crepe. None of these observations bother me, I simply find it all very amusing and interesting for a country that's so proud of being laïc. 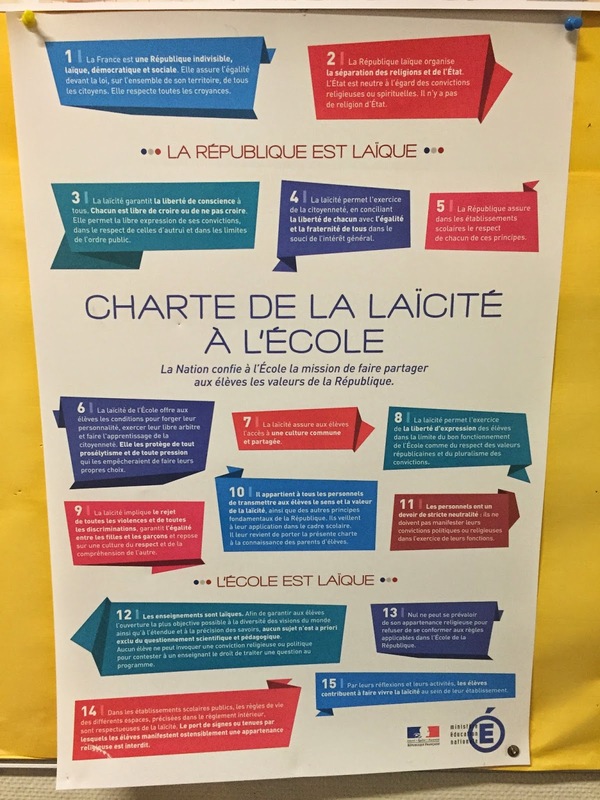 Here is the Charter of Laïcitie posted in the entrance of the school.